This weeks roundup of the top stories (or at least the most interesting ones) has been a tough one to whittle down. This week’s roundup of the top stories (or at least the most interesting ones) has been a tough one to whittle down. The big story, of course, that burned through the Web (and social media and what’s left of traditional news outlets) was the heated House hearings on the clunky rollout of the online component federal exchange enrollment. The hearing, predictably enough, amounted to Republicans digging around for more problems with the exchange rollout (not that they needed any more help), Democrats defending it and the developers who were called to testify blaming the administration. With the techies and the GOP singing the same song for one day, it amounts to the most bipartisanship we’ve seen on the Hill in years. In fact, now even a few Democrats have started to call for a delay of the individual mandate. Could a new era of cooperation (even if out of frustration) be around the corner? 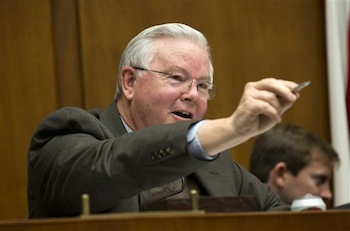 But my favorite quote of the day has to go out to New Jersey Democrat Frank Pallone, who told chairman Joe Barton, R-Texas, “I will not yield to this monkey court!” If he’d had a wig and robe, I’d have thought I was watching BBC coverage of the House of Commons. Nice throwback. This, of course, follows the administration’s sudden “Carrier Summit” at the White House. Several carrier execs shuffled up Pennsylvania Avenue earlier this week to presumably meet with administration officials and figure out their next move. Couldn’t help but notice no broker representatives were present. Guess we shouldn’t be surprised they were left out again. Naturally, all of this led to calls for Sec. Kathleen Sebelius’s resignation. It’s fair enough, and I can’t wait to hear what she has to say if she shows up on the Hill next week. I’m only surprised it took this long for cries for her head to ring out. Lost in the headlines (or should I say tweets/?) of the House hearing was the president’s renewed push for immigration reform. This is disappointing on several fronts. For starters, this is long overdue and resolution here could provide our economy with a much-needed shot in the arm. Secondly, this is an issue both parties are much closer together on than most these days, but after the budget/debt ceiling debacle, the GOP will be hard pressed to work with the administration on this, if simply out of spite. But, ironically, reaching some kind of deal on immigration could be just the thing Republicans need to resuscitate their gasping poll numbers. A Pew Research Center poll found that about half of Facebook users — a little less than a third of the population — get their news from Facebook. Not on purpose, mind you, but incidentally while they’re trolling for cat pics or old college buddies. I’d wager that’s still more than those of us who still read old-fashioned newspapers. I find this interesting not only as a journalist, but a someone who is constantly talking to brokers (and carriers) about how they communicate with clients — and their employees. And, finally, you might have missed this New York Times piece detailing Conde Naste’s termination of their intern program. The move apparently comes in response (or retaliation) to the latest in a string of lawsuits filed by said interns over low wages. Thus begins the end of another valuable workplace tradition.